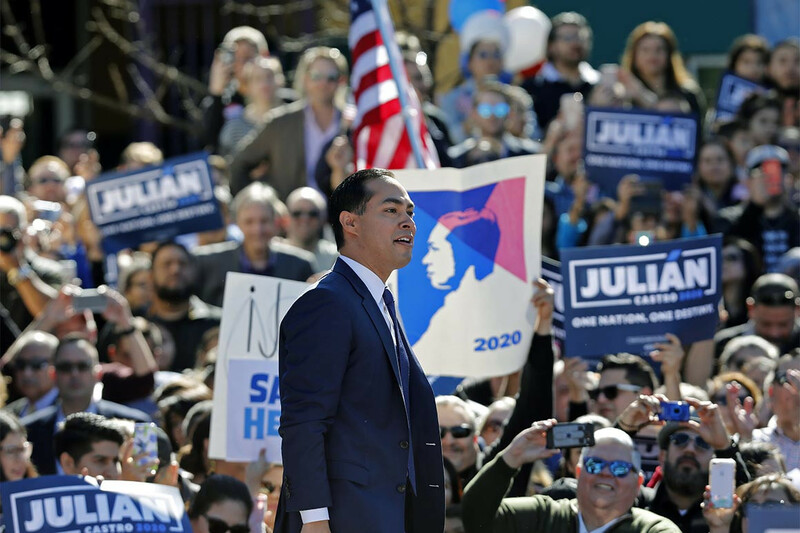 When Julián Castro laid out his vision as a presidential candidate Saturday, the language was subtle but unmistakable. The same held true for the optics of his 2020 campaign launch. The former Housing and Urban Development secretary’s bid is a play for the Obama coalition, the amalgamation of diverse constituencies — young, African-American, Latino, Asian — that the party sees as its future in a demographically changing America. As a Mexican-American and one of the youngest candidates in the crowded Democratic field, Castro’s potential appeal to the voters who elected Barack Obama to two terms is obvious, even if his path to victory is harder to envision. Castro’s speech wasn’t targeted toward minorities or people of color, Cisneros said. From the staging of his presidential launch in his hometown of San Antonio, a fast-growing city with a distinctive Mexican-American heritage, to a speech delivered in English and Spanish, Castro is embracing his distinction as likely the only major Latino candidate in what’s expected to be a wide, diverse field. Castro met with Latino leaders in Las Vegas last week as part of his outreach efforts. He’s also met with Latino activists in Washington, D.C., and while stumping in Iowa for local candidates during the midterms. “Secretary Castro is very committed to mobilizing the Latino community in every election, and he’ll continue working with activists in the community and the related issues and listening to them and talking with them as much as possible,” campaign spokeswoman Jennifer Fiore said. Castro’s speech nodded to the immigrant experience, an issue that is likely be central to the 2020 presidential debate. The hope and optimism he spoke of stands in direct contrast to President Donald Trump’s rhetoric and policies on immigration, which have angered and mobilized many Latino voters against the administration. Their turnout will be essential to Democratic fortunes against Trump, a fact party leaders are acutely aware of after Hillary Clinton in 2016 fell short of Obama’s 2012 performance with Latino voters. Castro took on Trump Saturday, specifically the president’s claim last week in McAllen, Texas, that there’s an “invasion” at the southern border, where the president wants to erect a wall to address what he insists is a national security crisis. Castro made clear his commitment to the Hispanic community with his first campaign stop as a presidential candidate: not one of the early presidential states, but Puerto Rico, the U.S. territory devastated by and still recovering from hurricanes. Residents on the island can’t vote in the 2020 presidential election but can cast ballots for the primary. In San Juan, Castro will address the Latino Victory Fund at a political summit, visit with residents still recovering from the hurricane devastation, and tour recovery sites with Mayor Carmen Yulín Cruz. Castro was in Iowa last week and will be in New Hampshire for events Tuesday and Wednesday. In both overwhelmingly white states, Castro is likely to find it difficult to break out of a sprawling field of better-known and better-financed figures. In another key early state, South Carolina, Castro will also have an uphill fight. According to 2016 exit polls, 61 percent of the Democratic primary electorate was African-American and top-tier candidates of color such as Sens. Cory Booker (D-N.J.) and Kamala Harris (D-Calif.) are poised to get a foothold. Nevada, however, offers great promise: Roughly 20 percent of Democratic caucusgoers were Latino in 2016, according to entrance polls. Not long after Nevada come two of the most delegate-rich states: California and Texas, which have large Hispanic populations and will vote on Super Tuesday, March 3. As a Mexican-American, Castro could be well-positioned to compete in either primary. But in his home state, Castro’s fortunes could be complicated by the possible presence of another Texas rising star, former Democratic Rep. Beto O’Rourke of El Paso, who is considering a presidential run. Castro allies, however, believe that even though O’Rourke has emerged as a national player and record-breaking fundraiser in the wake of his narrow 2018 loss to GOP Sen. Ted Cruz, Castro will win over the Hispanic community. Castro’s prospects aren’t solely predicated on his ability to capture the Hispanic vote. He’s also eyeing another part of the Obama coalition: millennials and young voters. At 44, the former San Antonio mayor is more than three decades younger than likely front-runners Sen. Bernie Sanders (I-Vt.) and former Vice President Joe Biden. The Castro twins went live on Facebook on Saturday as they took a public bus to the venue where Julián Castro announced he is running for president. And his staff live-tweeted his speech. Tags: Castro, Coalition, heard, Makes, Message, play, they, Обама.